Parabens, man-made preservative chemicals, are used by manufacturers in a variety of domestic products, such as cosmetics, lotions and moisturizers, shampoo, shaving, and tanning products. Parabens are cost-effective and provide protection against micro-organisms for an extended period of time. While there are multiple types of parabens, methyl, propyl and butylparaben are the most frequently used in beauty products. In recent years, concern has increased as to their role in producing potentially serious health side effects. According to Costmeticsinfo.org, data indicate that methyl, propyl, and butyl forms of parabens interfere with the functioning of the endocrine system. Specifically, parabens are endocrine disruptors stored in the body tissue that interfere with glandular activity and hormone production. Moreover, these preservative chemicals are associated with the following in infants and children: developmental disorders, dysfunction of the immune system, learning problems as well as reproductive disorders. The Food and Drug Administration states that several assessments made by the Cosmetic Ingredient Review report that parabens are safe, with no side effects, in cosmetics at levels up to 25 percent. It is advised that one read the ingredients in cosmetics before buying any products containing these preservatives. Ironically, while several of the commercial products that contain parabens are beauty products that are supposed to enhance the skin, such as lotions and moisturizers, research has found they accelerate the skin aging process. As reported by live-naturally.co.uk, researchers from the Kyoto Prefectural University of Medicine in Japan found that the methyl type of parabens increases sensitivity to and damage from the sun; that is, when exposed to ultraviolet rays, skin cells die at a much faster rate than normal. 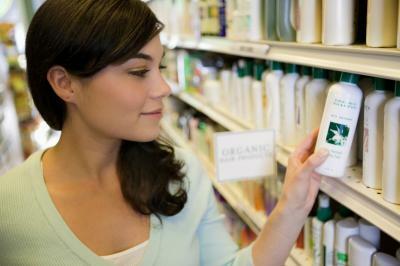 Therefore, one should read the ingredients to check for methylparabens before buying beauty products for the skin. In 2004, findings from a study published in the "Journal of Applied Toxicology" were released indicating that parabens may play a role in the development of certain types of breast cancer. Specifically, parabens act like estrogen, which may increase the risk of women developing estrogen-positive breast cancer. Researchers conducted tests on 20 different samples of human breast tumors, which revealed parabens to be present in each sample. This study was the first to indicate the seeping of these substances from the outer skin during application to underlying tissue. Additionally, the fact that parabens mimic natural estrogen is of special concern because estrogen can trigger and drive the growth of estrogen-positive breast tumors. These findings do not mean a specific cause-effect relationship exists; much more research is needed to determine the role of parabens. In addition to this chemical’s estrogen-like effects in women, parabens also have been associated with adversely interfering with the male reproductive system. According to live-naturally.co.uk, findings from several studies have reported low sperm counts as well as decreased levels of testosterone in men, and it was concluded that these results were related to the absorption of parabens in commercial products. Journal of Applied Toxicology: Concentrations of parabens in human breast tumours.